The F-140R exemplifies Roland’s ability to create high quality pianos with a very small footprint, making it a great choice for modern living spaces where the piano design is paramount. The unique lid design, which doubles up as a music stand, means that this piano has a very low profile appearance when not in use. The compact design does not compromise the quality of the piano. The F-140R has a progressively weighted hammer action feel with an ivory feel texture and includes the latest sensing technology to enable players to make the most of this piano’s vast tonal range. 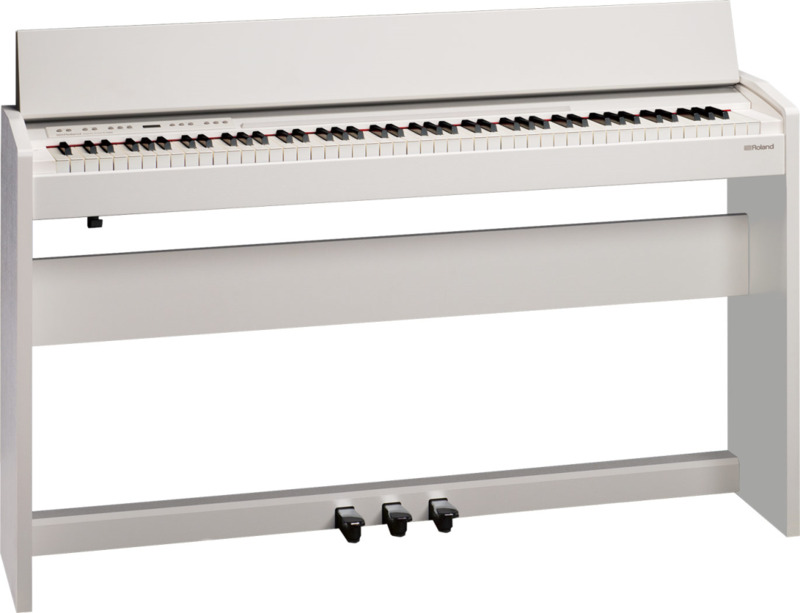 The F-140R also includes numerous digital convenience features for practice and fun, such as a built-in metronome, a recorder for capturing and sharing performances, computer connectivity via USB, and a Twin Piano mode that splits the keyboard so that two people can play side by side in the same ranges. The way people learn the piano is changing thanks to smartphones and tablets. Using apps like PiaScore gives free access to over 70,000 classical music scores and by pressing the piano’s pedal you can even turn the pages of the score on your tablet.